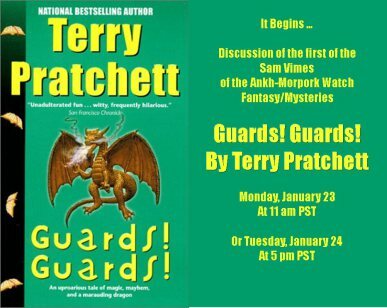 Lludmila Mirrikh at The Pub in Awen to discuss the first of the Sam Vimes fantasy/adventure/mysteries by Terry Pratchett: Guards! Guards! This story is nothing but pure fun. How would your average police handle a gigantic, flying serial arsonist? Pratchett riffs on many aspects of the mystery genre (the detective forbidden to pursue his inquiries, the rookie) as well as fantasy (What do dragons eat? Virgins, of course!) and it’s a million-to-one chance you’ll love it, but you just might. It’s the beginning of a series that will only get better.